Donald Trump has been elected the president of the United States, his VP choice was Mike Pence. Donald Trump is a life long New Yorker, and for the most part, he has always been at home here in NYC. However, he ran a campaign that nearly in every way went against what most New Yorkers stand for. Mind you, I am talking about NYC, I know that things are a little different on the outskirts. That being said, how can Donald Trump be upset, or surprised that when he, or his VP choice attend events in NYC, people will have something to say? I believe that Donald Trump may have been exaggerating in his rhetoric, I believe that much of what he said could easily be dialed back, and that has already begun to happen. However, Mike Pence, Jeff Sessions, and other folks he is surrounding himself with are not, they are the real deal. If Trump were to pass on, Pence would become President of the United States. Jeff Sessions is a forever politician who has been very consistent in his views. So yeah, Mr. Trump, you can tweet all you want, but we are going to have things to say. Things have now changed for you, Mr. Trump. Your campaign stood against the New Yorker way. This may have been your home all these years, and you may be a king among the plebs, but the plebs have a voice, and they will use it. Furthermore, I don’t think that Brandon Victor Dixon was disrespectful. He certainly put him on the spot, but he was respectful, stood up for him when the audience booed, and made a very fair and simple request. 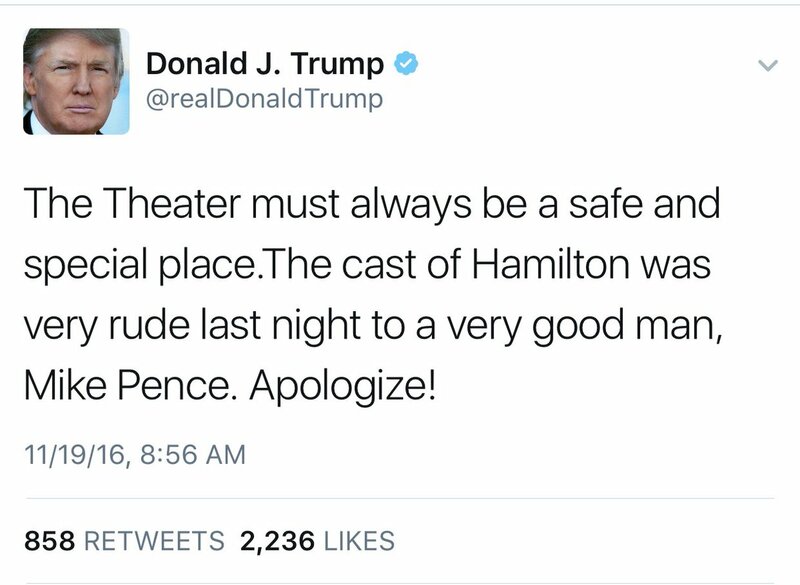 I don’t know how you dare mention a thing such as a “special and safe place.” That’s extremely ironic given the campaign you ran, and the results that have come about! Mike Pence is the real deal when it comes to conservatives, he’s way more dangerous and scarier than Donald Trump is, and the guy is one step away from becoming the President of the United States. I think this was a great message to deliver, and though I do believe he put him on the spot, politicians should be held accountable to the people. Isn’t that right Mr. Trump? This campaign, and the aftermath has brought forth a lot of negative energy and behavior. We have all seen the defaced public property, private property, and the posts from folks who have been either verbally or physically assaulted due to this renewed vigor in racism. I said before, that Donald Trump doesn’t scare me, but his racist supporters, not all of his supporters, the racist supporters are the ones that worry me. Trump must now realize that in running the campaign that he ran, he has made himself enemy number one within the “walls” (see what I did there) of the city he has always called home. Not that he cares, or that he has ever simply walked the streets carelessly. However, in a place like New York City, a place he calls home, where he is so recognizable, people will call you out. The voices will be heard, and you cannot expect that you or your homeboys will walk around here, given all that has happened, and words will not be said. Recently, I read a story of an Asian man who was pulled from a Williamsburg bar by the police and questioned by the Secret Service for making a humorous Trump threat. Is this America, or North Korea where simply speaking ill of the Great leader will get you arrested or worst? Donald Trump, you have the opportunity to use your voice and new found power to do right in this country. I appreciate what you did on 60 minutes in telling them to stop, but you need to do more than that. Furthermore, you need to stop whining and complaining when the people speak up to you, or your administration. You gentlemen are not Gods, and we are not your servants. We are your constituents, willing or not, and you must hear our voices, not attempt to silence or punish us. You are an older gentleman, but it’s never too late to grow, learn, and adapt. I hope you hear this message and make the necessary changes. Otherwise, you may find that you no longer have a home here in NYC. Do the right thing Mr. Trump.